Sue Beatrice's intertwined felines form an adorable heart pendant. 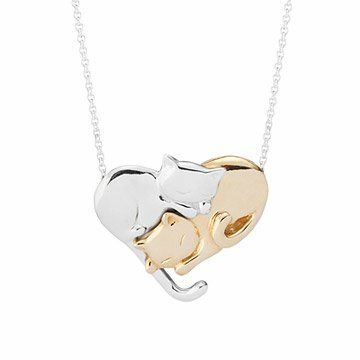 Kitty counterparts cuddle up to make an adorable heart-shaped duo in this mixed metal pendant. Sue Beatrice's intertwined felines were sketched, modeled in clay, cast in sterling silver and bronze, and joined in a purr-fectly balanced design. Hand polished to a brilliant shine and suspended from a sterling silver chain, the pair makes an endearing gift for any cat lover. Handmade in Sea Cliff, New York. Make it a set! Click here to see Intertwined Canines Necklace. The only gripe I have is that the chain is a bit short. A few inches longer would be perfect! Otherwise, it is everything I could have asked for. The metals are polished very well and look great together. The cats flow into one another really well and the design is too cute. Very meaningful for my girlfriend and I! I appreciate how unique the piece is; she will be the only person with it! Daughter loved this birthday present. She said it was sweet.